This exclusive Global 9 piece knife set with case includes 6 Knives including the famous G2, a Ceramic Sharpening Steel, a Pallete Knife, some Deluxe Fish Bone Tweezers and a Tasting Spoon. 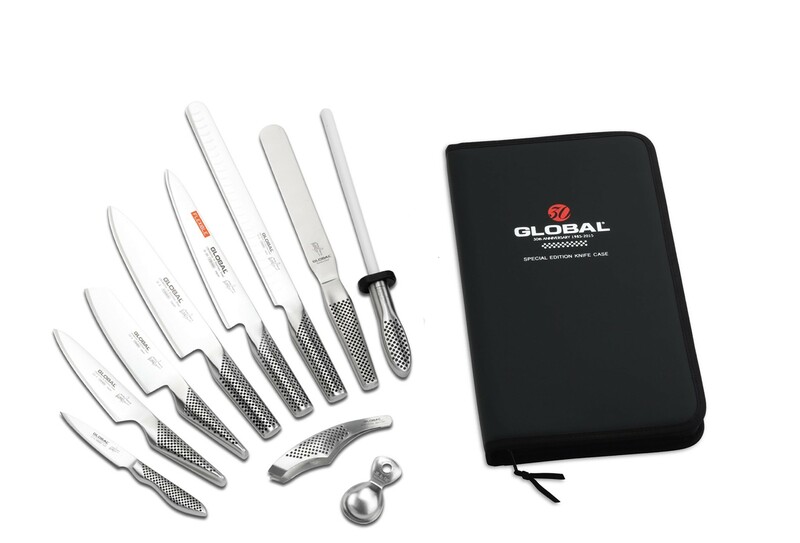 This Global 9 Piece chefs knife set comprises of a Global's most popular knife, the Global G-2 - 20.5cm chef's knife, the Global G-20 Flexible Filleting knife, the Global G-65 Ham/Salmon Slicer, a Global GS-3 13cm Cooks Knife, the Global GS-5 Vegetable Knife with 14cm Blade, the Global GS-21 Palette Knife, a Global GS-38 Paring Knife, the Global G-74 Ceramic Sharpening Steel, the Global GS-29 Deluxe Fish Bone Tweezers, the Global Tasting Spoon and a Global 9 Piece Knife Case. Global Knives first made an appearance in 1985 after the Japanese designer Komin Yamadi designed an exciting new range of knives to a modern design. Using the finest materials, the revolutionary design of Global Knives have won numerous awards and have become firm favourites of both chefs and home enthusiasts the world over. Global Knives are made from Cromova 18 Stainless Steel and are Ice Hardened to Rockwell 56-58, giving a keen edge which is easily sharpened. You’ve invested in a quality knife and with proper care it will last a lifetime. The Global range has been designed to be without dirt traps. This makes cleaning your knife a much easier task. Wash your knife immediately after use in warm water with a mild detergent – do not put them in a dishwasher. After washing dry with a soft cloth and if required sharpen using a Minosharp or Global Sharpener. Store your clean knife in either a Global Knife Rack or protect the edge with a Global Magnetic Knife Guard. High quality item and quite the deal for the set.